Associated Press Notre Dame's Arike Ogunbowale grabs a rebound against Texas A&M's Aja Ellison on Saturday. Notre Dame plays Stanford tonight with a Final Four berth on the line. 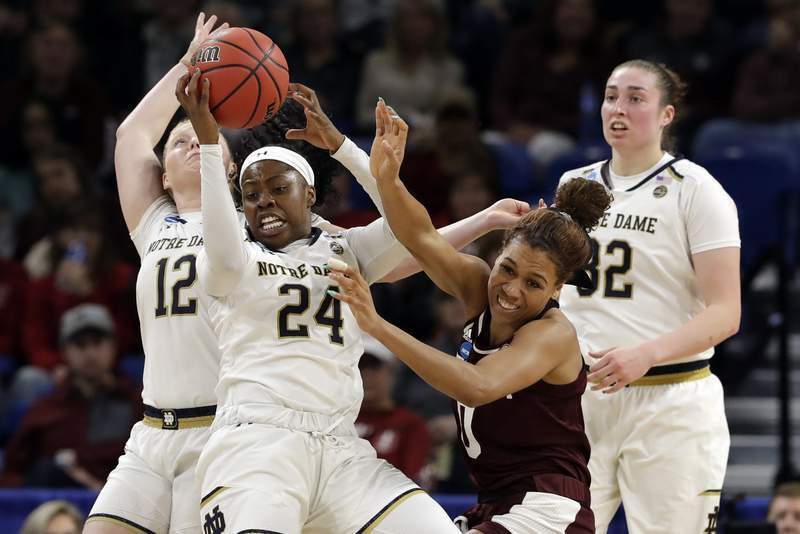 CHICAGO – Notre Dame needed a thrilling performance to get past Texas A&M on Saturday and return to the Elite Eight for the third year in a row and the 10th time in program history. The Irish (33-3) shot 52.2 percent from the field in their 87-80 victory, while Arike Ogunbowale scored 34 points and Jessica Shepard added 24. Meanwhile No. 2 seed Stanford, which will face the Irish today in the Chicago Regional final, had to scratch and claw its way to a 55-46 win over Missouri State just to make it out of the Sweet 16. The Cardinal (31-4) was held to just 25 percent shooting while scoring its second-lowest total points (and fewest in a win) all season. While Stanford shot poorly Saturday, its defense remained stifling, as has been the case for much of the season. The Cardinal has given up 60.6 points per game this season and hasn't lost a game in which it allowed 70 points or less. The Irish, meanwhile, lead the nation in scoring, averaging 89.2 points. Notre Dame and Stanford did not play last season, but the Cardinal knocked the Irish out in the NCAA Tournament in 2016 and 2017, and Notre Dame won their meeting in the regional semifinal in 2015. Because of Notre Dame's veteran lineup, the Cardinal has already played against all of Notre Dame's starters aside from Jessica Shepard, a senior who transferred to Notre Dame. The starting lineup of seniors Ogunbowale, Shepard and Marina Mabrey, and well as graduate student Turner and junior Jackie Young are just eight points away from a combined 10,000 points in their college careers, a milestone they will surely break in today's regional semifinal. McGraw said Sunday that both Young and Mabrey had gotten “a lot of treatment” and should be ready to go for today's game. Young went to the bench for a short period in Saturday's win after running into a screen and having the wind knocked out of her. Mabrey has scored just five points in the first three rounds of the tournament after hyperextending her knee last month.